January 25 - 10th/11th Grades (12:30 pm to 12:55 pm). Registration for the lunches has closed. NOTE: We need volunteers for these lunches. If you have the ability to volunteer for one or several of the lunches, please click here. Questions: click here. Tickets to a performance are $10/ adult and $5/ student. To purchase tickets, please click here. The Shelton Parents' Association in conjunction with Shelton Theatre Arts hosts a Pre-Theatre Dinner before the Friday evening production of Into the Woods. The dinner will be offered by Spice of Life catering and will begin at 5:00 pm. Enjoy a delicious dinner with your family and friends and, thereafter, journey into Sondheim's vision of Happily Ever After. To make a reservation for dinner ($10/ person), please click here. Dinner reservations must be made by 11:55 pm on Tuesday, February 12, 2019. See advertisement for more details. PLEASE NOTE: you must purchase tickets for Into the Woods separately. To purchase tickets to the Friday evening performance, please click here. The Stampede - At the Bomb Factory, 2713 Canton Street (Deep Ellum). The Stampede is the premier event for the Shelton Parents' Association and is one of the largest fundraisers in support of the work of the SPA. 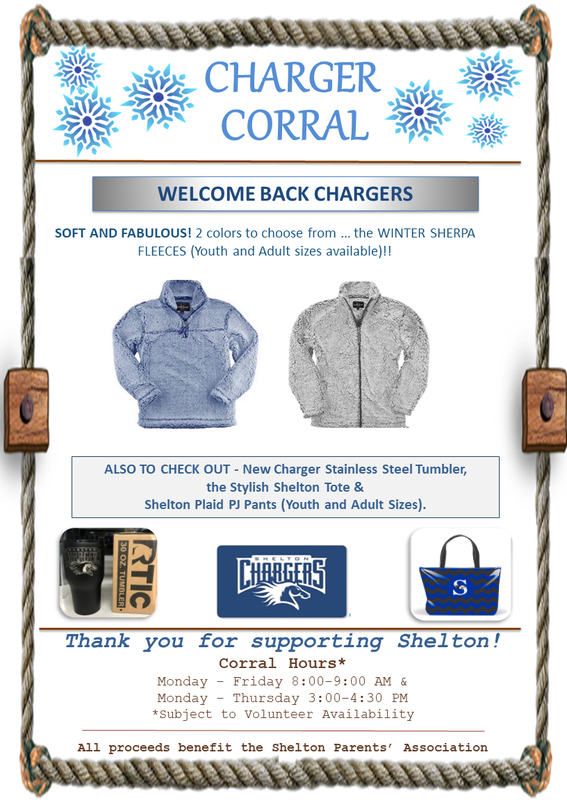 See ad below for more information regarding the online auction, Stampede Friday T-shirts, sponsorships, raffle tickets and donations. NEW INFORMATION EC/PP - A Dad's Social & Play Date - A fun morning for Dads and their children @ The Central Market Playground, 320 Coit Road, Plano beginning at 8:00 am. Siblings are welcome. In case of bad weather, the excursion will be rescheduled. Questions: click here. Upper Elementary School Parents' Mixer - For the parents of students in grades 3, 4 and 5 - a New Year's mix and mingle. From 7:00 pm to 9:00 pm at Mesero's on Beltline (5505 Beltline Road, Dallas 75254). Dutch Treat and parents only. RSVP by January 28, 2019; to RSVP, please click here. Questions: click here. NEW INFORMATION 5th grade Moms' Night Out - For 5th grade Moms, a night out at The Front Room @ Hotel Lumen, 6101 Hillcrest, Dallas. Time is 7:00 pm to 8:30 pm, Dutch Treat. RSVP by February 26, 2019; to RSVP, please click here. Questions: click here. Party for 7th & 8th Grades - An evening of fun for the students. There will be games and fun in the Shelton Dining Hall. From 7:00 pm to 9:00 pm. Note: the organizers for the party need contributions of cases of water, multi-packs of chips or other salty snacks, and $10/$20 gift cards to be given as prizes during the party. Moreover, volunteers for check-in and to be chaperones are needed! To contribute, volunteer at check-in, or to be a chaperone, please click here. Questions: click here. Middle School Parents' Mixer - For Middle School parents, a time to mingle with your fellow parents in the New Year. Dutch Treat and parents only. At Mesero's on Beltline (5505 Beltline Road, Dallas 75254). From 7:00 pm to 9:00 pm. RSVP by January 31, 2019; to RSVP please click here. Questions: click here. NEW INFORMATION 6th grade Spring Social - For all students in grade 6, plan for an afternoon at Dave & Buster's, 9450 North Central Expressway (Walnut Hill Lane @ Central Expressway), Dallas. Time is 3:00 pm to 5:00 pm. Food is available for purchase. Dave and Buster's requires that each student be with a parent or other responsible adult. RSVP by February 5, 2019; to RSVP, click here. Questions: click here. Cost information will be forthcoming, for now please save the date. The Stampede will be here soon! To purchase raffle tickets, please click here (remember - the prize is a year's free tuition at Shelton). To participate in Stampede underwriting and sponsorship opportunities, please click here. Individual tickets for Stampede will SOON go on sale, more information will be forthcoming. The Stampede Friday T-shirt is NOW available for purchase. Support the Stampede and give your student a Stampede Friday T-shirt. To purchase a T-shirt, click here. Act now - quantities are limited. Monday, January 28, 2019 at 10:00 am. But stay tuned for more information! 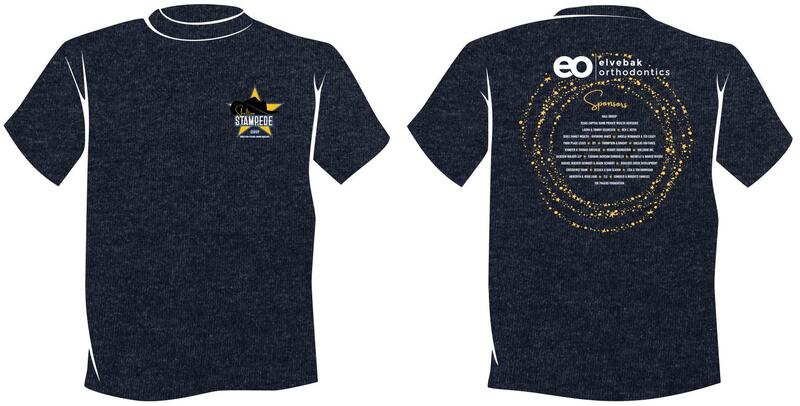 STAMPEDE FRIDAY T-SHIRTS ARE AVAILABLE! PURCHASE ONE FOR YOUR STUDENT NOW! FRIDAY T-SHIRT, PLEASE CLICK HERE. ACT NOW - QUANTITIES ARE LIMITED! 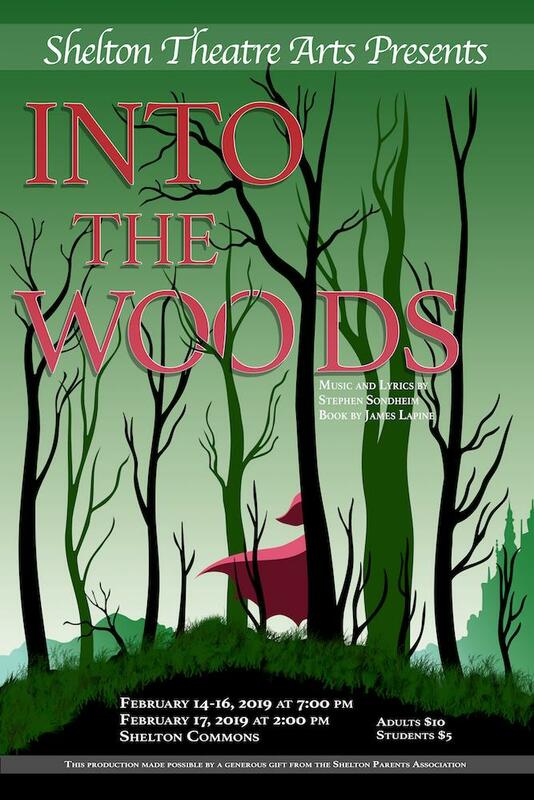 Shelton Theatre Arts presents the Spring Musical Into the Woods - Stephen Sondheim's popular Broadway creation which debuted in 1987 to rave reviews. The Washington Post wrote that Sondheim's lyrics were "brilliant .. and continue to remind us of the cautionary words: Be Careful What You Wish For". To purchase tickets to a production of Into the Woods, click here. Why not enjoy a fabulous dinner before the production of Into the Woods on Friday, February 15, 2019? Dinner will be served from 5:00 pm to 6:30 pm and will be prepared by the outstanding professionals at Spice of Life Catering. Enjoy a lovely dinner among friends and family and - who knows - Cinderella may be in the "Woods". Seating is limited so don't delay. To make your dinner reservations ($10/ person) click here. Reservations must be made by 11:55 pm on Tuesday, February 12, 2019. REMEMBER: you must purchase your tickets to the Friday performance separate from your dinner reservation. To purchase tickets to the Friday performance, click here.